Preparing for an accident is nearly impossible, because we never know when accidents will strike. They happen in the blink of an eye, and it's hard to keep things straight in the heat of the moment. The last thing you want is to jeopardize your future because of a simple mistake you made in the confusing aftermath of a car crash. Knowing what to do after a car accident can protect your legal rights. It's hard to make sense of an accident scene, but preparing yourself now will help you in the long run. Admitting Fault – After an accident, it's only natural to attempt to piece together the events that led to your crash. Sometimes, you might even think it was your fault. However, there could be many circumstances – such as road defects – that affected the crash. So until you have all the details, don't admit fault after an accident. Not Exchanging Information – There's nothing more frustrating than trying to work out a claim without being able to contact the other party. It feels like they're running away from the problem. Always exchange information with the other party, so your insurance company can get to work quickly. Not Filing a Police Report – For reasons we don't always understand, some motorists would rather not call the police after an auto accident. While this may be the way some want to handle it, don't be pressured into this situation. Contact the police, file a report, and get your details in order for the insurance company. It will make your claim a lot easier. Mishandling the Insurance Company – For fear of a rising premium, some people don't tell their insurance company about a recent crash. In other cases, accident victims simply miscommunicate with their insurance carriers, causing them to lose out on their claim. We recommend that you don't say anything or sign anything until you've spoken with an attorney. Not Contacting a Trusted Attorney – Maybe we're partial to this mistake, but it often comes back to haunt a number of accident victims, especially if they've suffered an injury. On average, you will recover more money after an accident with the help of an attorney than without. We hear over and over again from our clients that they only wished they'd contacted us sooner. 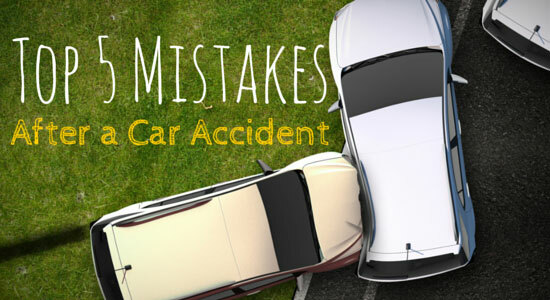 Be sure to check out the steps to take after an accident, so you know exactly what to do. It could be the difference between recovering compensation or getting stuck with the bill. As always, our legal consultations are always free. Just contact us at 1-866-943-3427. We're available around the clock to help with your car accident case. Remember, there's never a fee unless we get money for you.